Google's latest official Android Marshmallow Developer Preview Factory Image for LG Nexus 5, Motorola Nexus 6, HTC Nexus 9 and Google Nexus Player is now officially available for download and installation. Currently, Android Marshmallow Developer Preview (MPZ44Q) Version is limited to a selected Google Nexus smartphones and tablets, but soon it will be available for other Android device makers too i.e. Samsung, Sony, Huawei, Lenovo, Xiaomi, Acer, Asus, Oppo, ZTE etc. 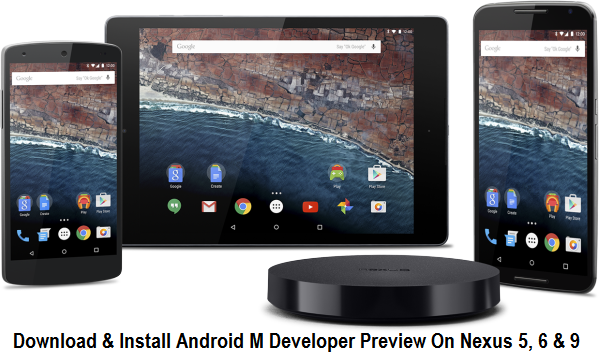 Below you can read full working guide, method and Tutorial on How to Manually Download, Setup, Install and Run Android Marshmallow Developer Preview on Nexus 5, Nexus 6 and Nexus 9 available for Windows, Mac OS X and Linux operating systems. Android developers and non-developers (general public users) can officially download Android Marshmallow Developer Preview (MPZ44Q) hardware system factory image files directly from Android Developer website. Google's Unlocked Nexus 5, Unlocked Nexus 6 and Unlocked Nexus 9 smartphone and tablet device users can manually install and flash Android Marshmallow Developer Preview beta build firmware after setup and config the preview Android Marshmallow SDK. Android Marshmallow SDK Manager in Android Studio includes; Android Marshmallow Developer Preview SDK tools, Android Marshmallow Developer Preview emulator system image (32-bit & 64-bit) and Android Marshmallow Developer Preview emulator system Image for Android TV (32-bit) etc. Android Marshmallow OTA (Over-the-Air) Updates will be publicly available by Q3-2015 or Late-2015. Take full Back up of your Nexus device to avoid any data loss. Make sure Android USB Drivers for Nexus devices are installed. How to Install Android Marshmallow Developer Preview on Nexus 5, Nexus 6 & Nexus 9? Step 1: Download Android Marshmallow Developer Preview factory images via above links, and extract all contents to a folder and put it on your PCs / Laptops desktop. Step 2: Ensure proper Setup and Config of Android ADB and Fastboot on Windows, Mac OS X and Linux. Step 3: Go to the folder hammerhead-MPZ44Q (for nexus 5 in Step 1) and then copy/paste all the files to your Fastboot directory i.e. platform-tools folder in your Android SDK directory. Step 5: Your Nexus device will boot with Android Marshmallow factory image installation and your device will restart after completion of whole process. Congratulations!! You're done.